A while ago on The Splendid Table I heard Lynne Rossetto Kasper interview a dear southern lady who talked about southern biscuits and all the love and low-gluten passion that went into their making. 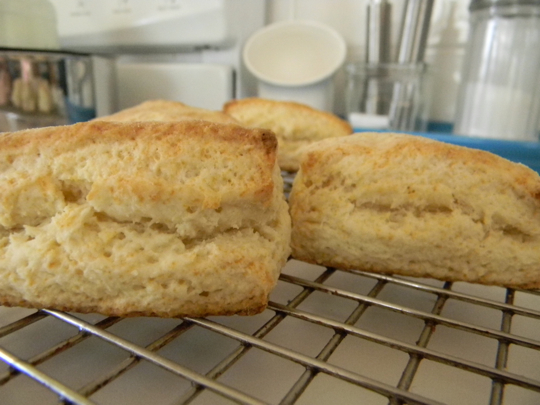 She said that when she teaches beginners how to make biscuits, she starts with an easy recipe that only requires two ingredients: self-rising flour and heavy cream. A half-cup of cream, plus a a little more if needed. Ok! Here we go! 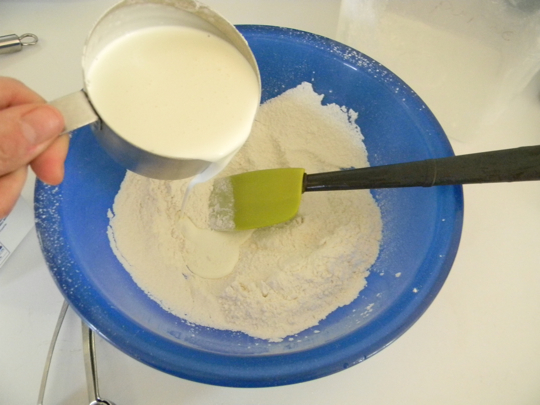 Except that I realized that I barely had a cup of flour, and I needed to keep some in reserve for patting out the dough. Crud. This was going to involve math. Fraction math. Nope. 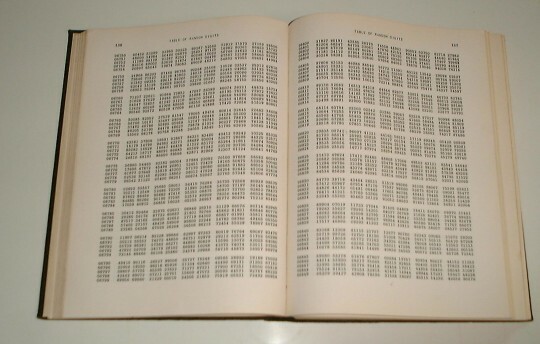 Estimating would have to do – accurate math is for accountants and bankers. I just scaled everything else back a little. A little less baking powder, and what I thought was a little less salt. Then I started to pour in the cream. You’ll noticed that there is almost a cup of cream in that cup, not half a cup. D’oh! I realized it as I was pouring, though, and only poured in (maybe) the right amount. Pat out the dough. Fold it over and pat it again. Fold and pat. That’s enough already. We’re not doing laundry here. As I checked them mid-way I actually exclaimed, “Holy cow! 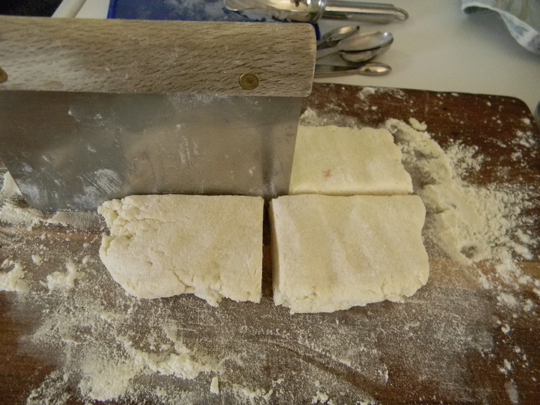 This is working!” They looked all flaky-ish, and I was mightily pleased. I could barely wait for them to cool! 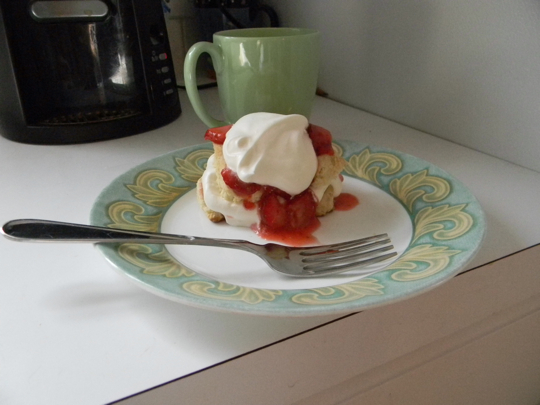 I whipped up the rest of the cream, slathered that biscuit with berries, set a cup of coffee up as a prop, snapped a photo, then dug in. Bleh. I don’t think I scaled back the salt enough. 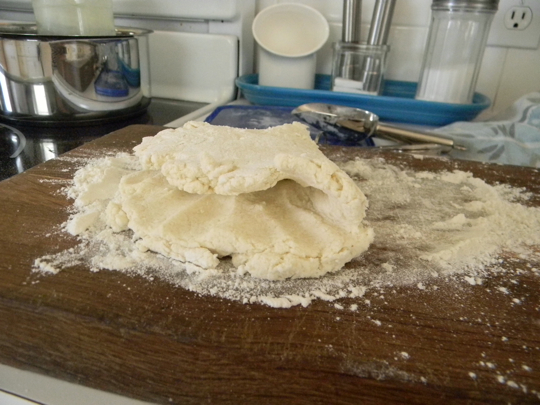 Either that or that dough needed heaps more sugar. 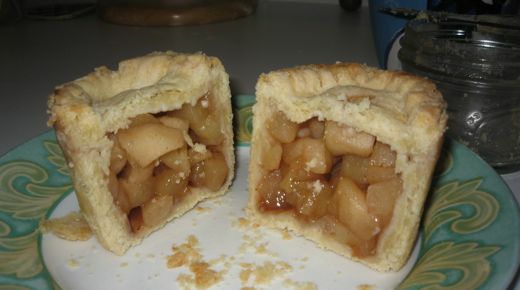 The texture was a little wet, too, like it could have baked a minute or two more. It wasn’t awful, but it certainly wasn’t the transcendent moment I was going for. Whatever. Let’s just look at the photo again, shall we? A Well Documented ‘meh’ …. HAHAHA! And I’m with Michelle….it certainly looks delicious! And remember, presentation is everything. 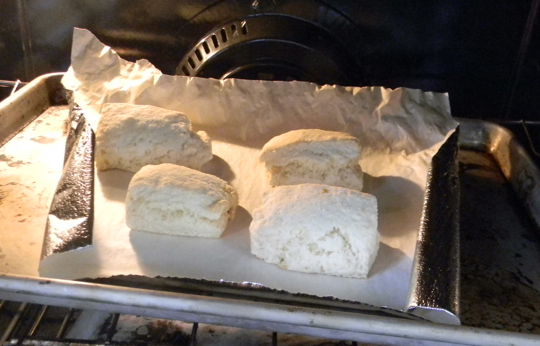 I have never made successfully made homemade biscuits, so I’m completely guessing here, but I wonder if you could have used all your flour in the recipe (so no estimating), left out the sugar and used powdered sugar to pat out the dough. A tablespoon of sugar? Were you trying to make one of those recipes where (weird) people say “I liked that. It was not too sweet”? Isn’t the correct ratio three parts flour, two parts sugar? Isn’t it cool that all the sentences in my comment are questions today?